Amazon Price: $579.99 $409.99 You save: $170.00 (29%). (as of – Details). Product prices and availability are accurate as of the date/time indicated and are subject to change. Any price and availability information displayed on the Amazon site at the time of purchase will apply to the purchase of this product. 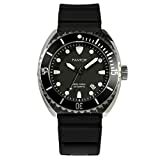 Pantor Automatic Dive watches's mission is to further the great tradition of mechanical timepieces by offering purpose-built instruments that feature innovative and original design solutions. Our premier model,is a automatic diver watch with an emphasis on utility. In keeping with the tenet of "form follows function", every design and engineering decision was based on how to maximize the usability and efficiency of each component. The unique design, stable automatic movement and unlimited practicality make it a perfect watch for daily life,diving and outdoor sports. Japan made 24 jewels automatic mechanical movement with a 21,600 beat rate and about 41 hours power reserve. 316L stainless steel Case with high quality finishing. Water resistant: 500m/1650ft Professional diver watches. Bezels: 316L Stainless steel Rotating Bezel. High quality Rubber and Leather strap with steel buckle. Hands and dials with Swiss made C3 Super LumiNova. Screw down Helium Valve at 9H. Movement: Japan made NH35A 24 jewels automatic mechanical movement with a 21,600 beat rate and about 41 hours power reserve. Case Material: 316L stainless steel. Bracelet Material: Rubber and leather strap. 1-12H with Swiss C3 super LumiNova. 1*Pantor Sea turtle Wrist Watch. 1*Multifunction watch packaging, can be used for other products.